There’s something very intellectual about Jake White. As he chats away on the phone from Canberra, I imagine him looking honestly at me from behind his new ebony-coloured spectacles, and sincerely responding to my probing examination. For all intents and purposes, Jake is not a man of few words, which just about defies his academic demeanour. If talking rugby were an Olympic sport, Jake would be the only entrant, as the others would cry off in shame. He instantly set about his work, onboarding former Brumbies household names George Gregan and Eddie Jones as consultants, and rekindling the AIS relationship. It unquestionably has the aroma of former Brumbies’ glory days. We both snigger, but it papers over the cracks of a South African system racked with obtuseness. I breathe a sigh of relief; I’ve hit a soft spot. The frost of those words begins to set in. I also give him the opportunity to explain the Lions debacle in which he was embroiled. He is candid in his response. “The reality was I offered my services as a consultant to look at the organisation from a rugby point of view and was paid a consultancy fee.” I sense his irritation at being asked. His reply was more delightful than I could have ever envisaged. “Now that I’ve realised what the answer is, none of them, because they’re all eligible to play for Australia.” Bingo. Rob has called Cape Town, London and Melbourne home during 30 years in this lifetime. 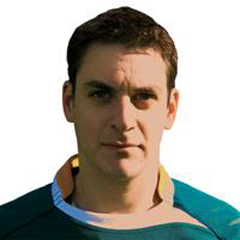 He has had a banking career, was Communications Officer for the Springbok Supporters Club UK and writes a rugby column for expat publication The South African.